경상북도 경주 굴불사터에 있는 이 불상은 바위의 서쪽에는 아미타여래불, 동쪽에는 약사여래불, 북쪽에는 미륵불, 남쪽에는 석가모니불을 각각 새긴 사방불(四方佛) 형태이다. 『삼국유사』 에 의하면 신라 경덕왕이 백률사를 찾았을 때 땅속에서 염불 소리가 들려왔다고 한다. 땅을 파 보니 이 바위가 나와서 바위의 사방에 불상을 새기고 절을 지어 굴불사라 하였다고 전한다. 이 기록만으로는 분명하지 않지만, 여러 가지 여건으로 보아 이때쯤 불상이 만들어졌을 것으로 추정된다. 서쪽의 아미타여래는 신체만 돌기둥에 조각했고 머리는 따로 만들어 놓았는데 머리가 얼굴보다 크게 표현되어 꼭 모자를 쓴 것처럼 보인다. 신체는 당당하고 굴곡있게 표현되어 있으며 손과 발 또한 사실적으로 조각되어 있다. 좌우에는 다른 돌로 보살입상을 세워 놓아서 3존불의 모습을 띠고 있다. 동쪽의 약사여래는 양 발을 무릎위로 올리고 앉아 있는데 몸 전체가 앞으로 숙여져 있다. 얼굴 표현은 매우 세련되었으며, 신체는 활기차고 긴장감이 넘쳐 보인다. 북쪽면의 오른쪽에는 도드라지게 새긴 보살입상이 서 있고, 왼쪽에는 6개의 손이 달려있는 관음보살을 얕은 선으로 새겼다. 오른쪽의 보살상은 둥글고 예쁜 얼굴, 굴곡있는 우아한 자세 등 그 표현이 매우 뛰어나다. 남쪽면은 원래 3존상으로 되어 있었는데 일본인들이 오른쪽 보살을 완전히 떼어 가고 가운데 본존상의 머리마저 떼어갔다고 한다. 미래세계에 나타나 중생을 구제한다는 미륵불을 표현한 것인데, 굴곡이 진 신체의 모습과 얇은 옷주름의 묘사가 매우 뛰어난 솜씨를 자랑하고 있다. 이처럼 입체의 표현, 음각과 양각의 표현, 좌상과 입상의 표현 등을 변화있게 배치한 점은 매우 특이한 경우이다. 풍만하고 부드러우면서 생기를 잃지 않은 솜씨를 볼 때 통일신라 초기의 특징을 잘 보여주고 있는 작품이라 하겠다. 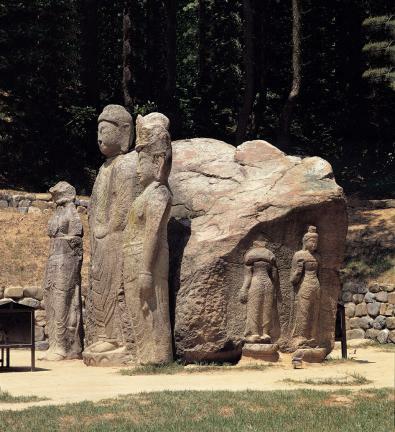 These stone Buddha statues, which are situated in the Gulbulsa Temple site in Gyeongju, Gyeongsangbuk-do, have been carved on all four sides of the rock: Amitabha Buddha on the west, Bhaisajyaguru Buddha on the east, Mitreya on the north, and Sakyamuni on the south. 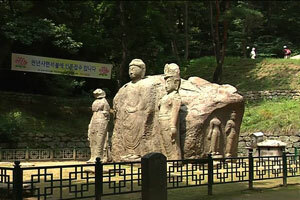 According to Samguk Yusa (Memorabilia of the Three Kingdoms), when King Gyeongdeok (r. 742~765) of Silla went to Baengnyulsa Temple, he heard a Buddhist invocation coming from the ground below. 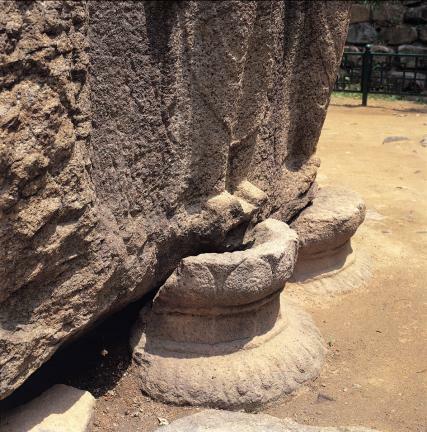 When he dug the ground, he found a rock, carved Buddhas on its four sides, and built a temple called Gulbulsa Temple. Although not certain based only on these records, it is believed to have been built around this time given the circumstances. 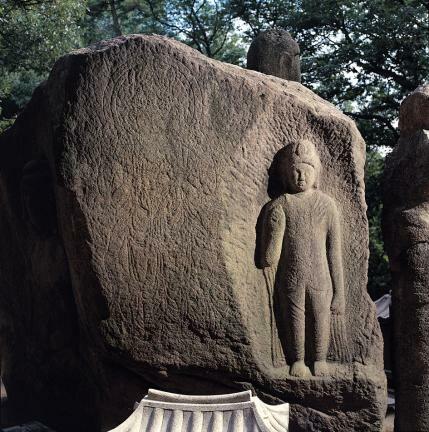 The standing Amitabha statue on the western side has a body made from a stone pillar with a separate head. 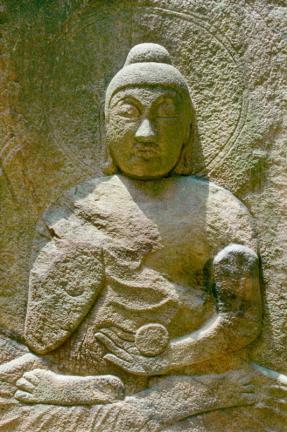 The topknot on its plain head is bigger than the head, so the statue appears to be wearing a hat. 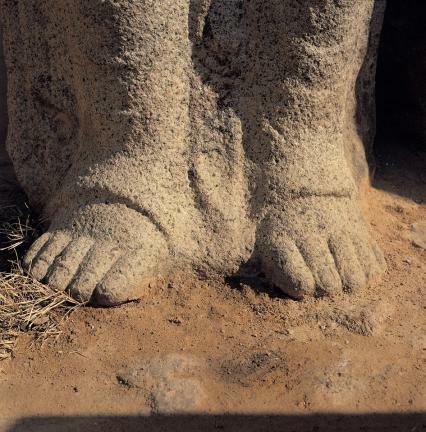 The body curves and looks solid, and the hands and feet are carved in a realistic way. 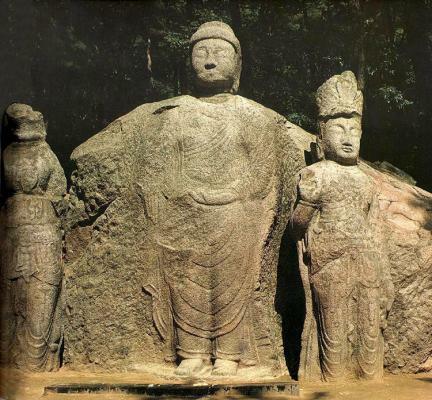 The standing Bodhisattva statues, standing right and left to the Amitabha statue, are made of different types of stone and are in the shape of a Triad. 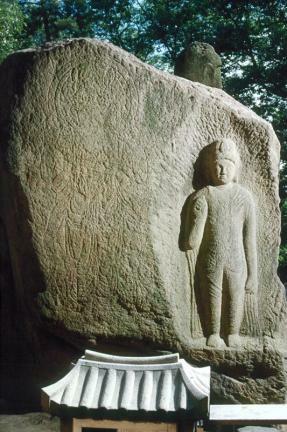 The Bhaisajyaguru Buddha on the eastern side is sitting with his legs crossed, and his body is tilted forward. The facial features are very refined, and the body has a tense, energetic aura. 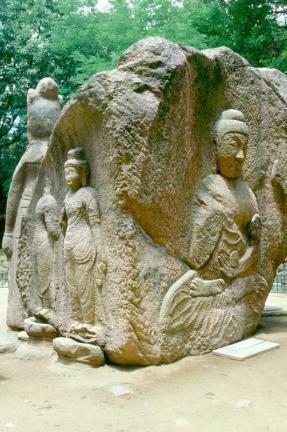 There is an embossed statue of a standing Buddha on the right side of the northern part of the rock, with an Avalokitesvara Bodhisattva with six hands carved on its left side. 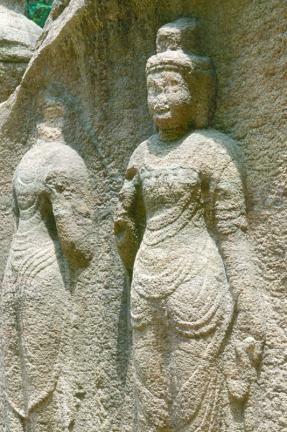 The right statue of a standing Bodhisattva has a round, pretty face, and it is positioned in a curved, elegant manner. On the southern side, there was originally a triad, but it suffered terrible damage during the Japanese invasion. 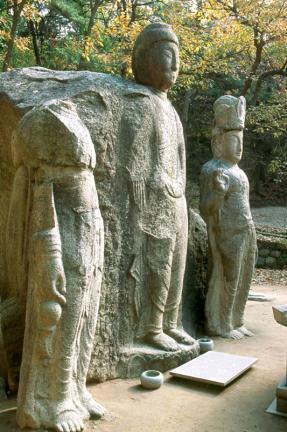 The statue on the right side and the middle statue's head were taken by the Japanese. 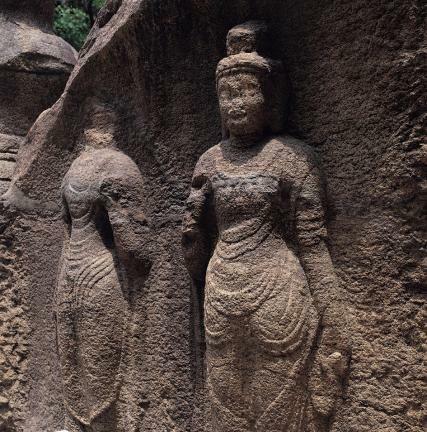 The curves on the body and the thin folds of clothes portray a futuristic-looking Buddha. 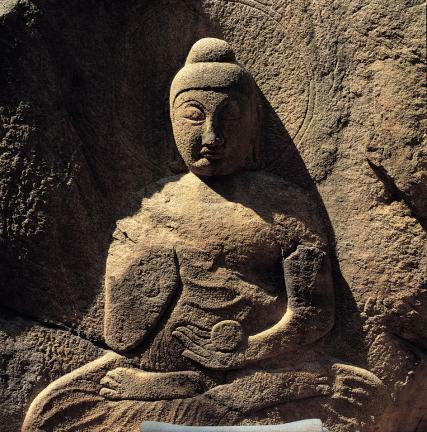 The changes in the three-dimensional expression and the carvings on the seated and standing statues are very unique. 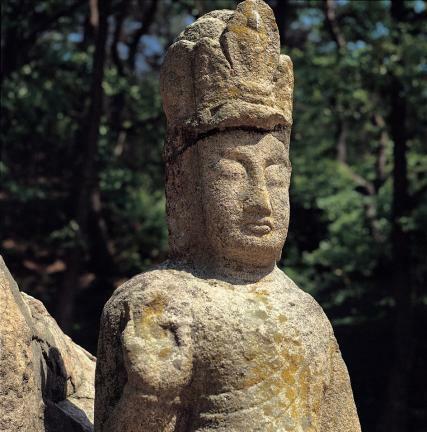 The full and subtle liveliness of the statues expresses the style of the early Silla Dynasty.